Before we dive into the review, it’s worth mentioning Truefitt and Hill’s history. Truefitt and Hill is the official shaving line of the royal family of England. Prince Harry uses this stuff, and that guy is a ladykiller. That has absolutely nothing to do with the shave, of course, but still – it’s pretty cool. But really, this is one of the iconic brands of shaving. Truefitt and Hill has been around a really, really long time. In fact, Truefitt and Hill is certified by the Guinness Book of World Records as the oldest barbershop in the world, getting their first Royal Warrant from King George III. Think about that. Truefitt and Hill gave King George III a shave. The point is: there’s history there – history, and about as much experience as you’re going to get in any shaving company anywhere in the world. And you don’t last that long by making crappy products. Full disclosure: anytime we review a Truefitt and Hill product, we try to stay objective, of course, but we also approach them with a tiny bit of a reverence and trust, which we just can’t seem to shake. Truefitt and Hill take their job as one of the most well-known and oldest men’s grooming companies around very seriously. They take it so seriously, that they have even created their own grooming guide to help their costumers look and smell their best. This sparked our interest, so we thought maybe you’d be interested in it too. Let’s take a look at the grooming guide now! Truefitt and Hill feel that the best way to get a perfect shave is by preparing your skin first and foremost. Shaving after a hot shower or after steaming your face with a hot towel is ideal to get a super close shave. The heat and moisture will help to soften your beard and primes the skin for shaving in a better way than shaving without those two things. Truefitt and Hill suggest using a daily facial cleanser as part of your shaving routine because it too can help you get a better shave. Applying a pre shave oil will help protect your skin from damage that can be caused by a razor’s blade and will nourish the skin to reverse damage that has already been done. Pre shave oil will soften the hair follicles of you beard, which will allow the blade to move smoothly over your face and avoid irritation. You won’t need to use a lot of oil, but just the right amount applied to the face and beard before shaving will make a huge difference. The Truefitt and Hill grooming guide suggests using a shaving cream that has a glycerin base that is loaded with natural moisturizers. You can use a badger, horse or boar shaving brush to apply your shaving cream after you have worked it into a rich lather. Using a shave brush to apply shaving cream will lift the hairs away from the skin and coat each one with cream. You will get a nice smooth shave and a little exfoliation in the process. It is best to shave with or across the grain of your facial hair, rather than shaving against it. If you shave against the grain, you will likely suffer from razor burn and skin irritation. 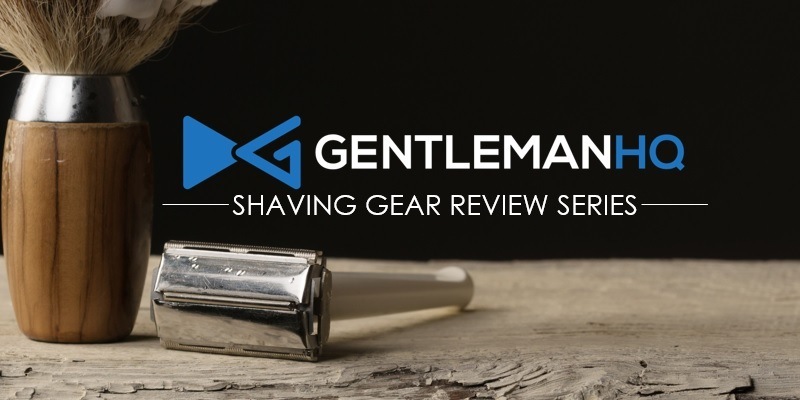 Running your razor under water frequently during the course of your shave is a good idea as well since you want to remove all of that built up hair and shaving cream residue. Truefitt and Hill emphasize the importance of using a good quality razor and blade, which we completely agree with. A dull blade won’t do you any good and will probably end up giving you some nicks and cuts before too long. Once you have completed your shaving routine, make sure to rinse your face with cold water to close your pores again. Doing this will keep your shave nice and smooth for longer than if you were to skip this step and you’ll be able to hold off the usual 5 o’clock shadow for a few hours. Gently patting your skin dry with a clean face towel is a better option that rubbing it, in our opinion. You did just take a super sharp razor too it, so be nice and give it gentle pats. Truefitt and Hill advise using an aftershave balm with lots of natural moisturizers to soothe your skin after your shave. Some natural moisturizers to look for in your aftershave balm are aloe vera, vitamin E and lanolin. Almond: A medium scent reminiscent of almost liquor. Rose: One of the few floral scents available from Truefitt and Hill; refreshing and light. 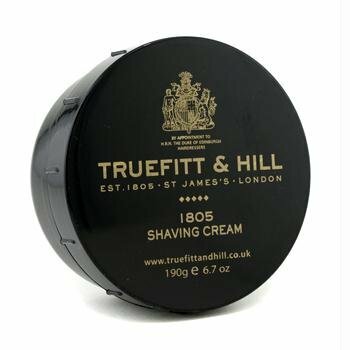 1805 (fresh): By far Truefitt and Hill’s most popular shaving cream; a fresh, clean scent most find rather addictive; you won’t be able to stop smelling your own face! Grafton: This is a pretty manly one. Truefitt and Hill’s Grafton shaving cream is spicy and masculine with a touch of leather. Sandalwood: A classic, woodsy scent with citrus undertones. Trafalgar: A woodsy, forresty scent full of spice and jasmine. West Indies Lime: Zesty, fresh aroma with a hint of South Pacific fruit. Truefitt and Hill’s shaving creams are glycerin-based. Glycerin is found in lots of shaving creams and soaps. It’s a component of fat/oil that’s used quite a bit in the pharmaceutical and personal care industries – in everything from toothpaste to cough syrup to (you guessed it) shaving cream. Glycerin is usually added to products to make them smoother and slicker. It’s commonly added to soaps and creams for people with sensitive skin, since it acts as both a lubricant and moisturizer. So, glycerin-based shaving creams and shaving soaps usually provide a slightly smoother shave. The same is true for Truefitt and Hill’s shaving creams. However, unlike some shaving creams that contain a lot of glycerin, we found that T&H is more prone to drying out. It doesn’t happen all the time, but it may be worth investing in a small bottle of glycerin (a good thing to have for any wet shaver, anyway), so you can add a drop or two to your lather if you feel it getting dry. Truefitt and Hill’s packaging has always been great. It’s classic, classy and masculine. The same is true for their shaving creams. They all come in sleek, black tubs with gold writing and royal warrant. The royal warrant is a seal issued to craftsmen or tradesmen showing that they supply the royal family (shout out to Rick French, who told me what a royal warrant is; thanks!). The tub itself features finger grips on around the lid – a simple innovation that makes it much easier to handle when wet. The only thing that really changes from scent to scent is the box. The Almond shaving cream, for instance, comes in a cream-colored box accented with dark brown, while the Grafton comes in a silky black box. As we’ve said before, shaving is an experience, and little details like great packaging really lend a lot to the feeling of luxury. Right out of the tub, this shaving cream yields a good lather. If you’d like a bit more body, you can whip it in a shaving mug, but it works just find if you apply it directly with your hands. Remember: it tends to dry out when whipped. If this happens, the tendency is to add a bit of water, like you would with shaving soap, but we found that this tends to make Truefitt and Hill’s shaving creams go watery pretty fast. Instead of adding just water, add a drop or two of water and a drop or two of glycerin as needed. You can always add more, but you can’t really take it away. Another thing we noticed was that Truefitt and Hill shaving creams conducted heat like a skillet. Even just whipping it by hand warms it up nicely. If you happen to have a shaving mug, this shaving cream can go nuclear. Really, it gets super-hot, so be careful. You may even have to let it cool down for a minute. A warm shave is nice. A molten-lava shave… not so much. That said, the overall experience is divine. Truefitt and Hill 1805 smells so damn good it’s not even funny. It’s like shaving your face in an ocean full out Altoids and springtime. This is one of those shaving creams you can probably use as a substitute for cologne. It’s not overpowering, but it smells good enough that people will notice. The first pass is relatively smooth, although we’ve had better first passes with some shaving soaps. However, the second and third passes are where this shaving cream really shines. With the majority of the stubble already cut, this shaving cream produces an exceptional layer of protection, and the razor absolutely glides – kind of like that episode of Magic School Bus where Ms. Fritz took the kids to an ice-skating rink with no friction. It’s just super-duper comfortable. We still generally prefer shaving soaps, but if you’re going to keep a shaving cream on hand, Truefitt and Hill shaving cream is a good choice. We recommend the 1805.